Outdoes all boasting and hyperbole. Os Lusíadas (The Lusiads) is a Portuguese epic poem by Luís de Camões. First printed in 1572, it is regarded as Portugal's national epic, much in the same way as Virgil's Aeneid was for the Ancient Romans, or Homer's Iliad and Odyssey for the Ancient Greeks. What glorious empire crowned their toils at last. Stanza 1 (as translated by William Julius Mickle, 1776). A New Age and win undying fame. Stanza 2, lines 7–8 (as translated by Sir Richard Fanshawe, 1655). And whose dread sword the fate of empire swayed. Let us hear no more then of Ulysses and Aeneas and their long journeying, no more of Alexander and Trajan and their famous victories. 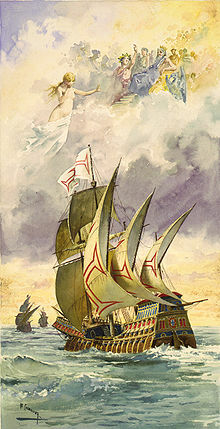 My theme is the daring and renown of the Portuguese, to whom Neptune and Mars alike give homage. The heroes and the poets of old have had their day; another and loftier conception of valour has arisen. Stanza 3 (as translated by William C. Atkinson, 1952). With equal rage, your warriors' deeds resound. Stanzas 4–5 (tr. William Julius Mickle). Que do gado de Proteu são cortadas. Where Protheu's Flocks their Rendezvouses keep. Stanza 19 (tr. Sir Richard Fanshawe). And curled and whitened round the nodding prows. As might, with sudden life, inspire the dead. Stanza 22, lines 5–8 (tr. William Julius Mickle); of Jove. With one stone, brighter than a Diamond. Stanza 58 (as translated by William Julius Mickle). To be a Lyon among Sheep, 'tis poor. Stanza 68, line 8 (tr. Sir Richard Fanshawe). Stanza 105, lines 1–2 (tr. William Julius Mickle). Stanzas 105–106 (tr. Richard Francis Burton). Which doth suppose it in Another's Brest. Stanza 9, lines 7–8 (tr. Sir Richard Fanshawe). Stanza 30, lines 5–8 (tr. Sir Richard Fanshawe). Quem faz obras tão dignas de memória. Stanza 113 (tr. Thomas Moore Musgrave). Stanza 20, lines 1–3 (as translated by William Julius Mickle). Stanza 21, line 1 (as translated by Richard Francis Burton). Stanza 119, line 1 (tr. Richard Francis Burton). 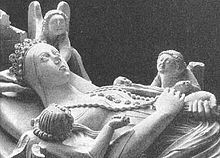 ... And pale in death the beauteous Inez lay. Stanza 134 (tr. William Julius Mickle). Both red and white, and the sweet life to boot. Stanza 138, line 8 (tr. Sir Richard Fanshawe). And all the rapturous graces of the fair! Stanza 142 (tr. William Julius Mickle). Gathered their little children in their arms. Se alcançam com trabalho e com fadiga. Stanza 78, lines 3–4 (tr. William Julius Mickle). Stanza 79, lines 5–8 (tr. Thomas Moore Musgrave). Of parting friends, constrained my tears to flow. I bear no bosom of obdurate steel. Stanza 87, lines 5–8 (as translated by William Julius Mickle). Stanzas 94–95 (tr. Sir Richard Fanshawe); The Old Man of Restelo. And say, has fame so dear, so dazzling charms? While life is scorned, and all its joys despised? Stanza 99 (tr. William Julius Mickle). Whatever his merit, or his deathless fame? Stanza 42 (tr. Thomas Moore Musgrave). Ó que não sei de nojo como o conte! O, how I choke in uttering my disgrace! A Mountain hard I found I did embrace. Overgrown with Trees and Bushes nothing sleek. And grew unto a Rock another Rock. Stanza 56 (tr. Sir Richard Fanshawe). And the black cloud dispersing leaves the sky. Stanza 60, lines 1–4 (tr. William Julius Mickle). Stanza 92 (tr. Sir Richard Fanshawe). Thou hope of Virtue, and her noblest crown! Without thine aid how soon the hero dies! By thee upborne, his name ascends the skies. Stanza 97, lines 5–8 (tr. Sir Richard Fanshawe). Quando às iras do vento o mar responde. When to the wraths of wind the sea respondeth. ... in few years (I fear) of Heaven and Sea, / Men, will be called Gods; and but men, We. Stanza 29 (tr. Sir Richard Fanshawe); Council of the Sea-Gods. They'll be the gods and you and I but Man. N'uma mão sempre a espada, e n'outra a pena. Stanza 79, line 8 (tr. Sir Richard Fanshawe). Of his chief Counselors, mainly rely. Stanza 54 (tr. Thomas Moore Musgrave). Stanza 96, lines 5–8 (tr. Sir Richard Fanshawe). What pretty whimperings, did the Grove repeat! Itself, and laught when it began to threat! But Those who cannot try it, let them guess. Stanza 83 (tr. Sir Richard Fanshawe). Stanza 93, lines 5–8 (tr. Sir Richard Fanshawe). The song that boasts my nation's proud renown. Stanza 9 (as translated by William Julius Mickle). Is gained, when justice triumphs and prevails. Stanza 58, lines 5–8 (tr. Thomas Moore Musgrave). Who dares be just even though it lose a Crown. who dares do naked Justice fair and free. Joaquim Nabuco's translation: "He who inflicts a vile and unjust harm by using the power and the force with which he is invested, does not conquer; the true victory is to have on one's side Right naked and entire." Stanza 145 (as translated by Richard Francis Burton). Stanza 152 (tr. Sir Richard Fanshawe); the poet advising King Sebastian of Portugal, then eighteen years of age. thy Portingals, who should command them all. yet the particulars none save experts know. Stanza 154, lines 5–8 (tr. Richard Francis Burton). who of Achilles envy never shall own. Who owe to Virtue fair encouragement. Without envying the Meonian Lyre. Expect thy sounding steeds and rattling shields. And shall these deeds unsung, unknown, expire? Oh, would thy smiles relume my fainting ire! 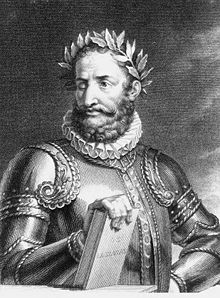 The most beautiful epic of the Iberian Peninsula is Portuguese: the Lusiadas of Luis de Camões (1572), the great epic of the ocean, which sings of Vasco da Gama's voyage around Africa and the Portuguese colonization of the Indies. Erich Auerbach, Introduction to Romance languages and literature (1961), p. 185.
the first epic poem which in its grandeur and its universality speaks for the modern world. Camoes' concern is not intellectual but aesthetic; his gods and goddesses come not from philosophy but from poetry. Os Lusíadas is in many ways the epic of Humanism. The most pleasing literary labour of my life has been to translate "The Lusiads". The Lusiad is so smoothly written, so harmonious, and so full of similes that ever since Camoëns' day it has served as a model for Portuguese poetry and is even yet an accepted and highly prized classic in Portuguese Literature. Hélène Adeline Guerber, The Book of the Epic: The World's Great Epics Told in Story (1913), p. 136. The first successful attempt in modern Europe to construct an epic poem on the ancient model. Camoens' poem has something of the charm of the Odyssey and of the magnificence of the Aeneid. Among the great Epopaea, which are constructed upon the basis of a classic culture, we must include the "Lysiad" of Camoens. In the subject-matter of this entirely national composition, which celebrates the bold sea-faring of the Portuguese, we are already beyond the true Middle Ages, and have interests unfolded, which inaugurate a new era. But here, too, despite the glow of its patriotism, despite the life-like character of the descriptive matter, based for the most part upon the author's own experience, we are still conscious of a real barrier between the subject that is national and an artistic culture that is borrowed from the ancients and the Italians. Georg Wilhelm Friedrich Hegel, The Philosophy of Fine Art [posthumously published lectures, 1835-38], Volume I (Hacker Art Books, 1975), p. 190; also in Hegel's Lectures on Absolute Spirit (Thoemmes Press, 1999), p. 189. Dr. Johnson told me in 1772, that, about twenty years before that time, he himself had a design to translate the Lusiad, of the merit of which he spoke highly, but had been prevented by a number of other engagements. William Julius Mickle, letter to James Boswell quoted in his The Life of Samuel Johnson, LL.D., Vol. II (1791), p. 473. ... chantés par le Camoèns, dont le poème fait sentir quelque chose des charmes de l'Odyssée et de la magnificence de l'Enéide. ... sung by Camoens, whose poem has something of the charm of the Odyssey and of the magnificence of the Aeneid. Montesquieu, De l'Esprit des Lois (1748) [The Spirit of the Laws], Ch. XXI. A sort of epic poetry unheard of before. There no bloody wars are fought, no heroes wounded in a thousand different ways; no woman enticed away, and the world overturned for her cause; no empire founded; in short, nothing of what was deemed before the only subject of poetry. Voltaire, An Essay on Epic Poetry (1727), 'Camouens'. This page was last edited on 8 December 2018, at 16:43.